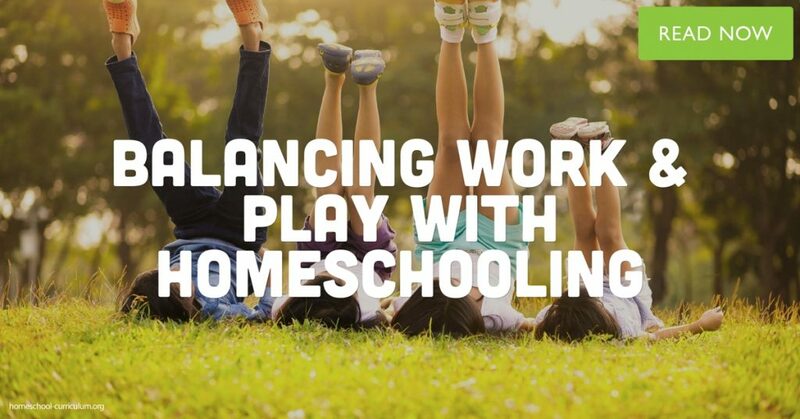 Home Blog How Do I Balance Work and Play in my Home School Programs? As adults, we have to go to work or get our tasks done most of the time, whether we like it or not. A child is much more honest with his or her opinion about things that are not liked, especially work-related tasks. Children need to learn that some things in life need to be done even if we don’t want to do them. But just like Mary Poppins’ spoonful of sugar to help the medicine go down, we can find ways to sweeten up the homeschooling tasks. Pack the Morning: Not all learning needs to come from tedious workbooks or hours sitting at the table working on compositions and math problems. Plan your book-learning time for the mornings then take your homeschooling away from the table or even outside in the afternoons. Look for hands-on activities that are fun, but also teach important principles to your children. Gardening, hiking, art projects, nature notebooks, science experiments, building, sewing, exploring . . . the list can keep going. Children at any age who are engaged, using their minds and hands, and actively exploring the world around them, will learn and have fun while they do it. Weekly Field Trips: A field trip can add excitement to your homeschooling and still be a productive learning activity. A trip to the zoo can be a resource to learn geography, science, and sketchbook practice. Look at factories or businesses in your area that offer tours. Planetariums, art galleries, and natural history museums give variety to your learning experience. You can always play tourist for a day and see your own hometown through new eyes—simply check out the Trip Advisor top ten things to do in your town and see if you’ve done them all! Fit Your Home School Programs to Your Child: Some families make the mistake of finding a wonderful new curriculum and then try to fit the child to the program. Homeschooling means you have the opportunity to create a child-based curriculum. The person who best knows the learning style of your child is you. When you fit the lesson plan to the child, you and your child will have a more enjoyable time with school work. Everyone needs a break from work from time to time, both children and parents. Children need to sometimes just be children and play a little. A trip to the park or an afternoon building with Legos can be a reward for finishing a task or difficult exercise. When you mix up the schedule and give your children the opportunity to refresh their minds, your homeschooling efforts will be productive in those times you need to concentrate on academics. So, work hard on the spelling lesson, and then schedule a playdate!